My running shoes and I have had an on again/off again relationship for about fifteen years. Our relationship has been complicated and filled with angst, heartbreak, and infidelity. While my shoes have been true blue, I have a cheating heart. Sometimes it was with others that I thought were better for me: yoga, aerobics, and that short lived affair in college with Tae-Bo. But usually it was just lust that pulled me away: late night nachos, cold winter weather, more sleep. But no matter how long I strayed, I always come back to my running shoes. While she welcomes me back with open laces, she punishes me for leaving her behind. The longer I’ve been gone, the longer it takes me to get back to where we were. Most days I don’t enjoy running. Maybe my running shoes don’t like me either or we aren’t compatible because I’ve never felt that “runner’s high.” But for some reason running and I just work. We always have, always will. I don’t aspire to run in a marathon or even the local 5K. No medals or time trials for this gal. I just want to be comfortable in my skin, my new skin. The skin that has been stretched and pulled. The hips that have spread. The body that has created, nourished, and carried my two greatest achievements. More than fitting into my jeans, I want my daughter to feel good in her skin. Better than I feel in my own. My little girl has the most delicious kneecaps and bitable thighs. I adore her round arms and the belly that hangs over her diaper. While admiring my precious baby, I started to ponder when do we stop loving chunky thighs on girls and start to dislike them? It was then that I realized that my running shoes mean more than this skin. Because my skin is a reflection of how she will see her own. I would die a thousand deaths if I thought I contributed to an unhealthy body image for that sweet, sweet girl. Enough of the excuses and hiding my running shoes in the back of my closet. I’ve been on a diet since I was 18. That’s when I started college and stopped running the first time. 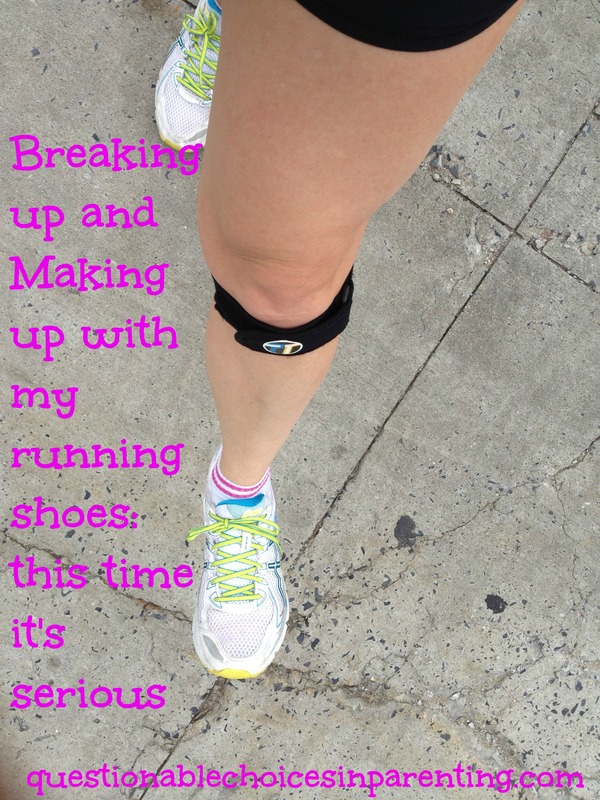 I started packing on the pounds, and the breakups and makeups with my running shoes started. The scale would go up, the running shoes and I would have another go ’round. Then numbers of the scale would fall, and I would tell my running shoes we were “on a break”. But this time it’s different. I think we are going to make it this time. This time it’s not just about the weight on the scale or my fear of saddlebags. This time it means a lot more. So I will eat ice cream with my kids, but I will also put them in the jogging stroller with me while I count the miles under my feet. I will entertain them with lollipops and sing them songs to get more time on the road. And I will teach my daughter to love the skin she is in because I created that skin and it is perfection. So let’s try this relationship again, running shoes. I thought about quoting a Taylor Swift song or maybe The Notebook to win you back, but you’ve never needed hearts and flowers, just me, my bad singing, and the road. You can do it this time! Hooray for shoes! You can do it! I have been meaning to get me some running shoes. However, life just keeps getting in the way. I hear you, lady! Life is always my reason too. I just need to make it a part of life. Thanks for stopping by and commenting! Well said Amanda! She is lucky to have a mom like you. Thank you!!! I hope so! !